It is often held that dielectric loss is a large contribution to total loss in practical transmission lines. Generally, the difference in loss between cables of a given physical diameter is dependent upon the dielectric material -- the "insulation" between the center conductor and shield. An insight can be obtained by using the loss model described at Transmission Line Loss Calculator, and plotting the loss model components (conductor and dielectric) for practical transmission lines. Fig 1 above shows the matched line loss components due to conductor and dielectric losses for RG213 and LMR400 coaxial transmission lines. The reason for the shape of the curves is that conductor loss increases proportionately to square root of frequency, whereas dielectric loss increases proportionately to frequency. Note that for RG213, conductor loss is much larger than dielectric loss up to 30MHz, ie dielectric loss is less than 10% of the total loss. In fact, it is not until 5000MHz that dielectric loss equals conductor loss (though by that frequency, very high loss limits the practical use of such a line). Lets explore WA7PRC statement made in the context of 144MHz. Dielectric loss in RG213 at 144MHz at less than 15% of the total loss is relatively small. Why then does so called ‘foam RG213′ such as LMR400 have 40% lower total loss at 144MHz? RG213 uses a solid polythene (PE) dielectric, and LMR400 uses foam PE dielectric, has approximately the same jacket and outside conductor diameter, and a larger centre conductor to deliver the same characteristic impedance as RG213. It is the larger centre conductor that is responsible for the lower conductor losses that is the main contribution to the relatively lower loss of LMR400 at HF. 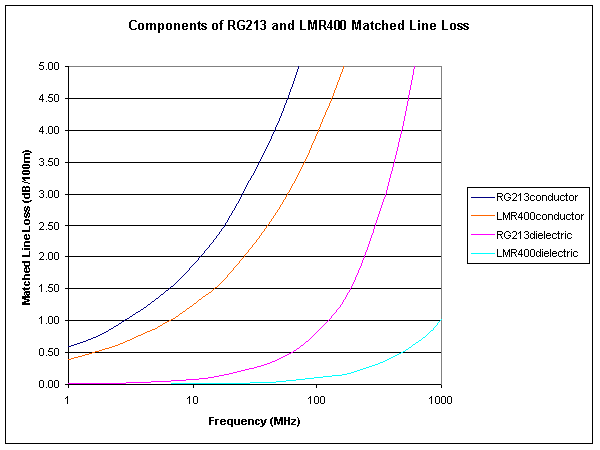 Whilst WA7PRC states that loss between cables of a given physical diameter is dependent upon the dielectric material , most of the loss reduction at lower frequencies in the RG213/LMR400 comparison is due to the larger centre conductor in LMR400, eg 70% of the loss reduction at 144MHz is due to the larger centre conductor and more than 95% at 1.8MHz. Of course, if low grade dielectric such as PVC is used, the dielectric loss at HF is more significant. Something to keep in mind when using ZIP cord, PVC insulated power cables, PVC insulated telecommunications and data cables for RF transmission lines at HF and above. QRZ discussion. Dec 2012 Help with what coax to use? http://forums.qrz.com/showthread.php?370288-Help-with-what-coax-to-use (accessed 04/12/12).